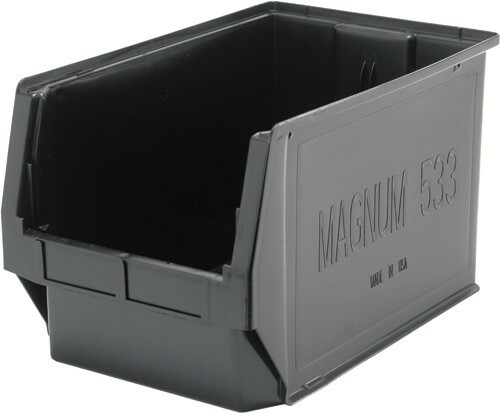 19-3/4"L x 12-3/8"W x 11-7/8"H heavy-duty, extra strong injection molded plastic stack containers are manufactured in the USA from post consumer high density polypropylene bins are ideal for transportation and storage of large and heavy components. Open hopper front allows immediate access and visibility. Ribbed reinforced walls ensure extra strength. 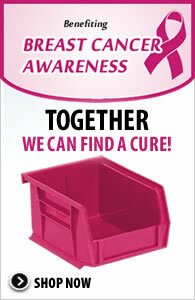 Double wall thickness with preformed lip allows bin to interlock and provides up to 150 lbs. stack capacity. 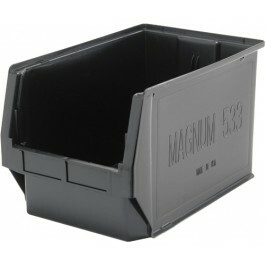 Transport these bins easily with rear molded handle. Molded in label slot. Impervious to most solvents and corrosion. Resists temperatures from -40°F to 250°F. Optional window maximizes storage and prevents spillage. 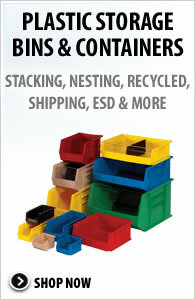 Optional dividers can help in creating a Par Level Storage System. Available in Black. 17-3/4" x 11-1/4" x 11"